struggle very much, however, initially every actor has to go through that period when he/she is trying to make that place for himself/herself in the industry, besides of course providing a comfortable life for his/her family. I remember, for instance, my mother often telling us that my father did not want to do Meri Surat teri Aankhen (MSTA) starring Ashok Kumar, Asha Parekh and Pradeep Kumar. MSTA was based on the Bengali novel Ulka (Comet) by Nihar Ranjan Gupta. It is the story of the ugly son who is rejected by his good looking father soon after he is born. man Rehmat (Kanhaiyalal) who is also a musical genius of sorts, agrees to adopt the child. He doesn’t care about the child’s appearance, all his wife and he want is a child to light up their lonely lives. He trains the child in classical music, needless to mention the child grows up to be Ashok Kumar. Later there is a love triangle between Ashok Kumar, his good looking brother Pradeep Kumar and Asha Parekh the doctor’s daughter. You can imagine my father who was very, very young then – you can see how young he was in the screen shot above – feeling a sense of discomfort at playing a father figure to Ashok Kumar, who was himself almost like a father to my father. Here is a brief scene (1min 27 secs) that I have chopped off from You Tube. 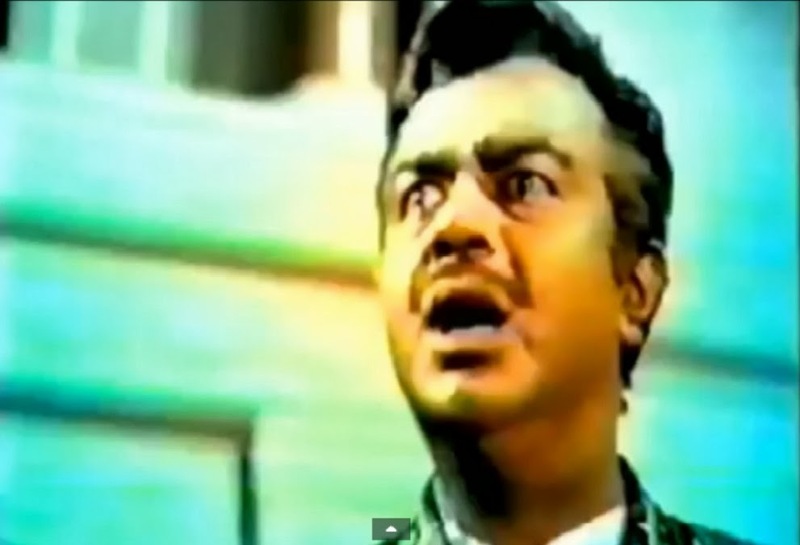 In this particular scene you can see how ridiculous my father looks as he addresses Ashok Kumar as beta (son). Besides that, during his Nagpur theatre days my father had directed and acted (he had played Ashok Kumar’s role) in Ulka. The play was a success and what came in for special praise besides his performance of course, was his makeup. My mother used to say that the makeup really made him look revolting. Despite my father’s misgivings, everybody coaxed and pushed him into doing the film. Actors often find themselves in these situations, where they find it difficult to say a firm no. In fact if any actor in the initial stages of his/her career is too choosy, then such an actor is often branded as someone with too much nakhra who thinks no end of himself/herself. When my father crossed forty, the younger generation of actors like Amitabh Bachchan, Jaya Bhaduri (whom he had seen as a kid in Nagpur), Anil Dhawan, Vinod Mehra, Raakesh Roshan, Yogita Bali, Navin Nischal, and so on, had begun making their presence felt. My father no longer felt uncomfortable playing their father. He was after all much older to them. 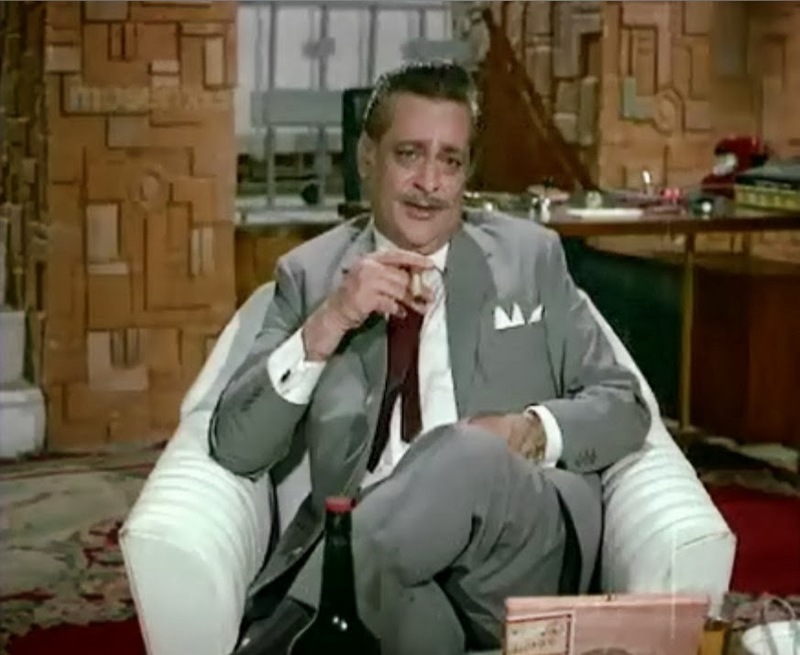 He was therefore quite happy to play Amitabh Bachchan’s father in Ek Nazar. The film’s story was nothing to write home about. 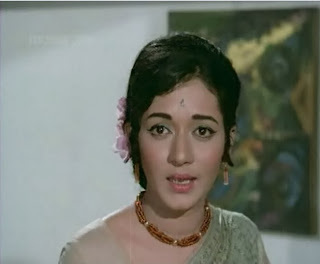 It was the usual, the hero a poet, son of an eminent lawyer (my father), falls in love with a nautch girl (Jaya Bhaduri). The son leaves his home and some twists and turns later, the nautch girl is accused of murdering her foster mother (Nadira). In the court of law she comes face to face with her lover’s father who is keen to see her behind bars. This was one of those few films after shootng for which he came back home a happy man. Why? Because he was happy to act with a talented newcomer. My father was all praise for him. He said, "This new boy is really good." Yes he used the word 'boy'. I have tube chopped two brief confrontation scenes between my father and Amitabh Bachchan. Nirmaan (starring Navin Nischal and Anupama) like Ek Nazar released after my father passed away. His role was a sort of a cameo, but it was quite meaty. Incidentally in this film my father and his screen wife Sulochana played the parents of Anoop Kumar and Sudhir who were nearly the same age as them. Anoop Kumar I think was older to my father. The other two children though were okay, one was Master Sachin and the other was the film’s heroine Anupama. 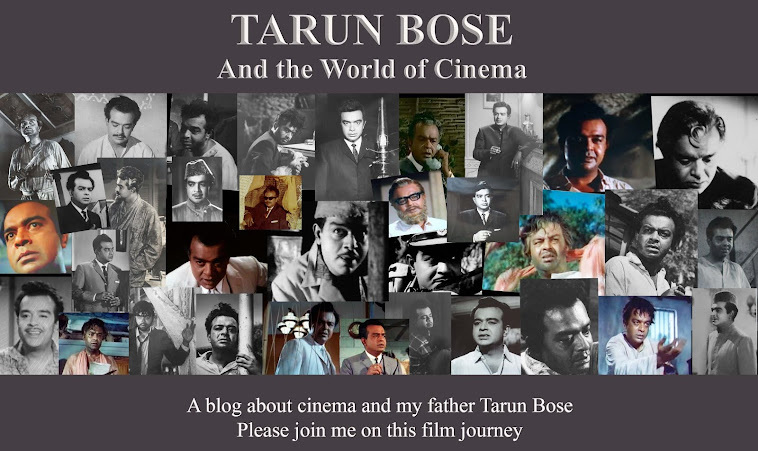 The film directed by Ravi Tandon (Raveena Tandon’s father) is about two friends Rehman and my father. My father helps out Rehman in his time of need only to have him stab him in the back. It is the scene where my father shocked by his dear friend’s treachery, confronts him ( Rehmaan) which really touched me. It was one of his best performances. He is moving around using a crutch, hurt and agitated, it was a heart rending performance. Here is a slide show of this scene. I just wanted to draw attention to his expressions and look of despair. It begins with him receiving a phone call, he is shocked to hear of his friend’s treachery and refuses to believe that his friend has cheated him. He then goes on to confront his friend. Aankhon Aankhon Mein (starring Rakesh Roshan and Raakhee) was also released after my father passed away. This was my father’s second film with J.Om Prakash’s production house. The role was once again a small role and it was pretty obvious to me that my father did it because of the good relations he shared with J.Om Prakash. I am talking about this film because of what we later learnt from the media. My father had to do a death scene in this film. He played Raakesh Rohan’s father in this film. After my father passed away we read in the newspapers that, after doing the death scene my father was not too satisfied, so he called up J.Om Prakash to find out whether it was okay or whether there was a need to re-shoot it. He said it was perfectly fine, but a few days later my father re-enacted that scene, this time for real. I could have posted the clip of that scene here, but it was too painful for me, so I decided against it. I have instead chopped off a short clip of a scene shot at Bombay’s Santa Cruz airport. There is nothing extraordinary about the scene, it is just that it serves as an excellent reminder of days gone by when the word security had no place in our lives. We had free run of the airports and therefore you find scenes at the airport in a number of old films. Bombay back then just had this lovely homely looking airport. Later on the international airport came up and the domestic airport was renovated and is today a far cry from what it was during our childhood. Since I have mentioned Meri Surat Teri Aankhen, here is a bit of information on how the writer came up with idea for this story. The writer Nihar Ranjan Gupta was a doctor in real life. It so happened that once he delivered a still born child. The child did not look good at all, which was surprising considering both the parents looked good. When the father saw the dead child, his reaction was one of relief, he thanked God that the child was still born. This reaction touched a chord in Gupta’s heart and he thought what if the child had lived? That is how he went on to write the story. There were extensive shooting schedules for Ek Nazar in Pune (at that time it was known as Poona), my father stayed away for long stretches of time, so much so that many wondered whether we had a second home in Poona. I remember we did miss him and I remember wondering why did my father have to sign a film with a flop hero like Amitabh Bachchan?. I had seen Anand and liked him quite a lot in that film, but he was a flop actor and sure enough Ek Nazar flopped too. My father though was all praise for him. Incidentally, the picture you see below is of the actor who played Amitabh Bachchan's friend in Ek Nazar. 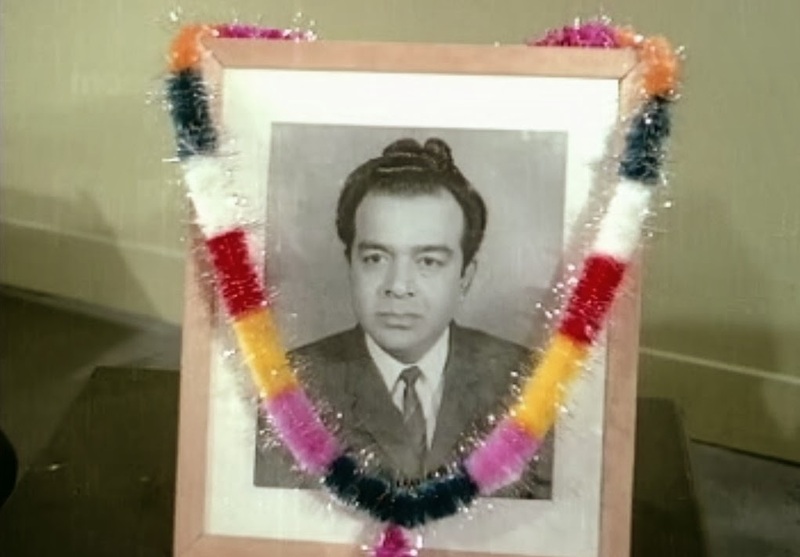 He is Ajit Deol, Dharmendra's younger brother and Abhay Deol's father. Aan Milo Sajana was a silver jubilee hit. While shooting Aankhon Aankhon Mein my father saw the film’s silver jubilee trophy. My father quite liked it for it was quite different from the usual silver jubilee trophies. Some of the silver jubilee trophies used to be quite gaudy and huge, keeping them was quite a bother. My father learnt that there would be a delay in the film’s jubilee function, because music director Jaikishan had just passed away (Shankar-Jaikishan were Aankhon Aankhon Mein’s music directors). However about six months later my father passed away, Mr. Prakash cancelled the function altogether and had the trophies delivered to unit members' homes. He instead dedicated Aankhon Aankhon Mein to Jaikishan and my father. Producers and directors often find themselves in a difficult situation on the sudden death of actors. My father had thankfully completed most of his films, there were some where he had just done a few days work and the filmmakers were able to take another actor without incurring much loss. However there were a few films where he was not able to complete his work, he had few days work still remaining. Nirmaan was one such film. I guess what was remaining was a death sequence. The director managed to handle the situation quite intelligently. 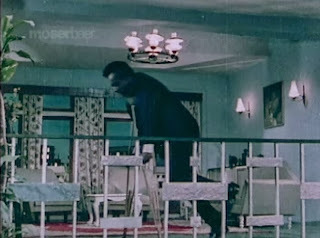 After his confrontation with Rehman, my father is shown making his way back from Rehman's house, it is here that the shot is frozen (below). Then the scene is cut and a you see a garlanded picture of my father. There was another film Anokha Daan which was also released after my father passed away. It was based on Inspector General. A Bengali film on the same subject ThanaTheke Aashchi starring Uttam Kumar was made long ago. 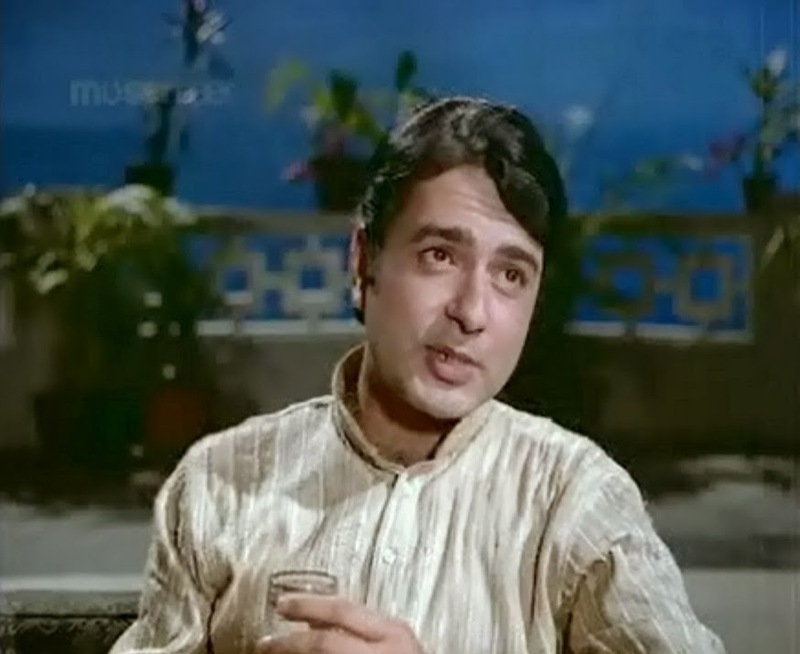 This film was a hit and director Asit Sen decided to remake it with Kabir Bedi in the main lead, the film also featured, Anil Dhawan, Rakesh Pandey, Archana and Zahira. My father was in a pivotal role and he was extremely happy to do this film. He put his heart and soul into it. When we saw the film later, I felt let down, my father gave a superlative performance, but the film was incoherent, and Kabir Bedi was a wrong choice, he was absolutely wooden. I do not have the film’s DVD neither is the film available on You Tube, so I could not add a clip or post screen shots from the film here, I managed to get the above screen shot from a song sequence. Had my father lived he would have been disappointed, for his performance would have been wasted, the film was a huge flop. These were some of my father's colour films, my next post will be about Hrishikesh Mukherjee with a special focus on Anupama and Satyakam. As you may have guessed, I found your anecdotes about Ek Nazar the most interesting. :) The film had wonderful performances and some lovely songs. Of course, having Jaya as a nautch girl was one of those WTH moments - she couldn't dance for toffee. It is sad that it flopped, though. Love your anecdotes about your father playing father figure to Ashok Kumar - yes, it was rather incongruous, no? But he was not the only actor thus constrained - many of our actresses find themselves playing mother to actors with whom they acted as the main lead. Yes Jaya often recalls in several interviews, how Waheeda Rehman had told her, "Was it necessary for you to dance?" You are also right about actresses having to play mother to their heroes. I have to admit I've never seen either Ek Nazar or Nirmaan, Shilpi, but still, I liked reading about them. 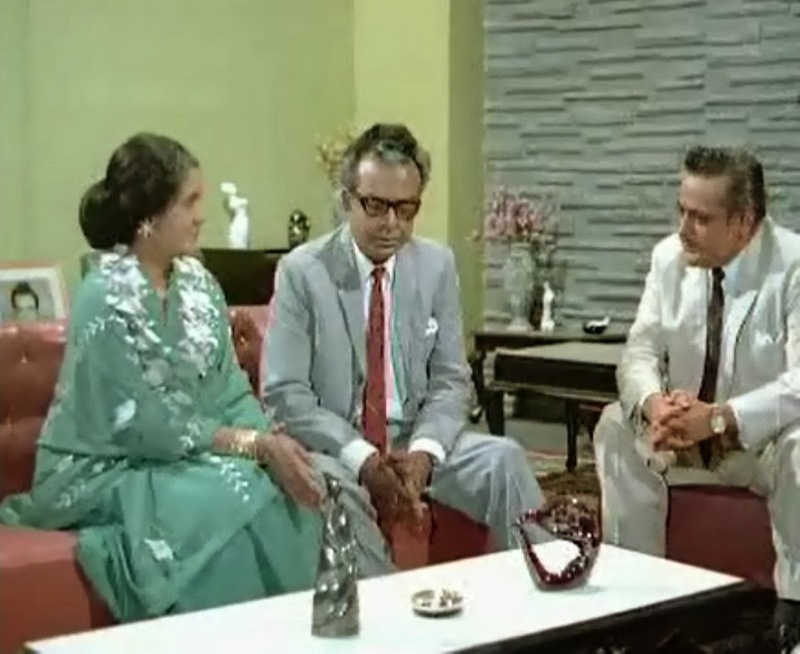 It's been several years since I watched Meri Surat Teri Aankhen or Aankhon Aankhon Mein - in fact, I'd forgotten that your father had acted in the latter. I remember Rakhee looking really pretty in that film. Yes you are right Raakhee was young then and she really looked pretty. So many intersting anecdotes! Wonderful! Your Dad playing Dad to Ashok Kumar is indeed ridiculous. Ashok Kumar is poora duniya ka baap/dada! I saw Ek Nazar long, long time back, must be sometime in the late 70s on Doordarshan and remember next to nothing of it. So what was your Dad's opinion of Jaya B? First time I'm hearing of Nirmaan. Kabir Bedi being woody is so true. One could just lose him in a forest, though he improved afterwards, but his looks saved him most of the times. The scene from Aankhon Aankhon Me reminded me of my annual visit to India. My parents can't come to recieve me, but the emotions are still the same. Real glad you enjoyed the post. My father played a sort of father figure to Ashok Kumar. As for Jaya B, from what I remember he appreciated her talent. I am laughing at your comment about Kabir Bedi, you are so right. Sad isn't it how times have changed that thanks to security, we are so restricted nowadays. Welcome to my blog, yes his death was untimely, he always believed that he would have long life.